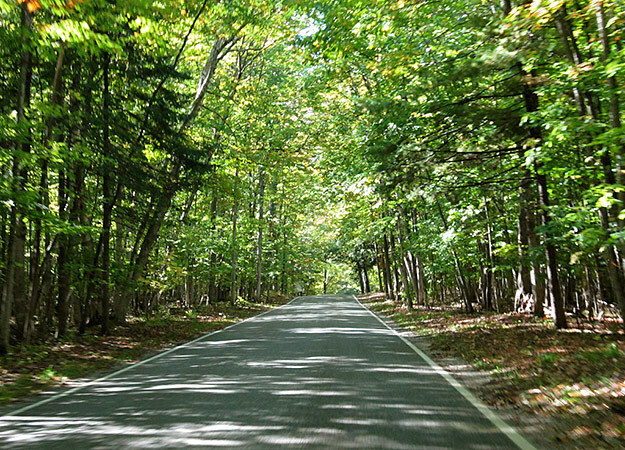 The Tunnel of Trees Road is ... not surprisingly ... one of the great forest routes in North America. It's located about 35 miles from the very popular tourist stop, Mackinac Island, at the juncture of Michigan and Upper Peninsula Michigan. Ride north around the harbor to go through the town of Harbor Springs and up the coast ... the Northern Michigan coastline is just spectacular. Tunnel of Trees Road is perfect for a fall ride during the color change -- try it in September for the very best vistas.